Description: Call it a pilsner, water, or iced tea glass this work by Bryce glass is nicely done....as usual. 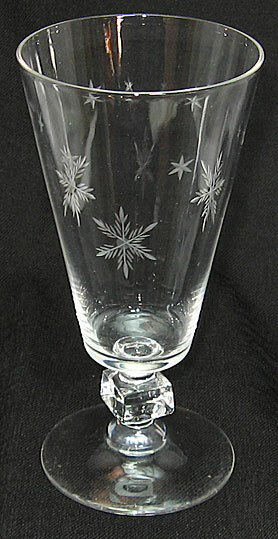 It features their Wilmington stem and a star/snowflake cutting, also very nicely done. Unfortunately, I've found little documentation on production dates for Bryce items. The company certainly deserves more recognition....and documentation...than it seems to have gotten so far. Height is just under 7". To buy an item (or more), just e-mail us, or you can call us at 812-467-0191. It works best if you include the "item" code to let us know which item or items you're interested in. The code is at the beginning of each listing and is usually two letters followed by a number.